When buying a wedding or engagement rings made ​​from precious metals such as platinum and white gold many wonder what metal is better to choose if they look the same? What distinguishes gold from platinum and can be at all - one and the same? The answer is - no, not the same thing. The white gold and platinum have their own specific properties that make them unique. White gold is an alloy of gold and some white metals such as silver, palladium, nickel, platinum. Its purity is measured by fineness the same as of yellow gold. Traditionally nickel was used as additional component to the alloy but nowadays it is replaced by other elements due to allergic reactions caused to some people. Sometimes rings prepared of white gold are covered by rhodium. Rhodium is close to platinum by nature and has a property which is appreciated highly be jewelers - it is wearing out very slowly. Rhodium coating is used to make white gold lighter and saturated. Actually the real color of the white gold is slightly grayish. Although highly resistant to impact rhodium too wears out. For this reason if you want to keep the white gold ring "in shape" once every 12 - 18 months get the ring “plated” again by special procedure provided by some jewelers. Platinum, unlike gold, is used in the manufacture of jewelry in almost pure form (share ligatures rarely exceeds 5%). Platinum is extremely resistant to wearing out and itself has a rich white color without the need for different kinds of tricks, like rhodium coating.It is a very dense and heavy metal. Platinum engagement ring compared with the same amount of gold will be felt more massive. Perhaps the main drawback of platinum is its price. Platinum ring without stones will be about 2-3 times more expensive than the gold one. The difference in price is due to a more complex technology of mining and processing of platinum. In fact both of these white metals look about the same. Platinum is slightly heavier and a little more durable. It is more suitable for the manufacture of sophisticated jewelry and simple wedding ring does not disclose all of the properties of the metal. Platinum will always be white and white gold with time gets a yellowish tint but still it is more brilliant than platinum, which quickly fades. When polishing white metals platinum lose less weight than gold due to greater strength. Platinum is hypoallergenic and white gold may cause an allergic reaction or rather, it does not by itself, but some of the the metals that is used in the alloy. If your skin is sensitive to certain metals when buying white gold make sure if the manufacturer used as ligatures noble palladium or the ligature is nickel. 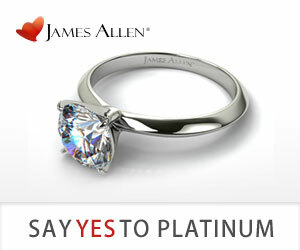 When asked jewelers almost always recommend platinum, of course, if you can afford it. On the other hand, the mass of people is wearing white gold and is happy with the choice. Home › Precious Metals › White gold or platinum?